I have made a grave oversight. I was planning on writing an update today on how the Paleo lifestyle (I hate the word "diet") has been going for me. I was scrolling through my blog posts to see what I wrote during my first Paleo blog entry and guess what? I never wrote one! I meant to, I really did. But I started my thirty days of a strict autoimmune Paleo lifestyle the day before my fiancé's mother died and it was not the priority. So now I am going to give you the recap of the past two months. I am not going to spend much time describing the Paleo eating plan because a Google search can give you more information than you ever could possibly want. Basically it means that you eat whole, non-processed foods just like our ancestors did. Meats, vegetables, fruits, nuts, seeds, certain natural oils such as olive oil and coconut oil. No dairy, grains (even gluten-free grains are off limits), legumes, sugar (except naturally occurring sugars in fruits), soy, and refined seeds oils such as sunflower, vegetable, and corn oil. Now, I had done a ton of research about this for a good five months before I even attempted changing my eating because I was going to go one step further. I was going to do the autoimmune protocol of the Paleo lifestyle which meant I was eliminating nuts, seeds, eggs, tomatoes and all tomato based products, eggplant, alcohol, potatoes, peppers, and certain spices that are pepper based such as chili powder. Have I mentioned how much I LOVE potatoes? And gluten/dairy-free pizza?? So I embarked on my little experiment and after the thirty days, I decided to add seeds and nuts back into my diet. Adding one food back in at a time from the autoimmune protocol list is allowed so that you can see what you can tolerate. From time to time, I will also have a pepper based spice because I absolutely love buffalo chicken; which I make at home. I will be honest, this lifestyle change has been one of the hardest things I have ever done in my life and trust me, I have had my challenges! I went through terrible sugar withdrawals the first two weeks or so and I found it very challenging to eat anywhere besides in my own house. However I was reading anecdote after anecdote of people with autoimmune disorders who were having improvement in their symptoms by eating a Paleo food plan. If there was even a chance that I could avoid going back on steroids or maybe even become more functional because of what I was eating, I had to stick with it. The Paleo lifestyle is also not just about what you eat. It's also about moving your body, attempting to reduce toxins in your environment, and cutting back on stress. Before I started the Paleo lifestyle, I had been eating gluten and dairy-free for a year. While I do think that helped a bit with my symptoms, it wasn't enough. However when I look back to what I was eating, a lot of it was processed dairy and gluten-free foods. I stayed away from anything high in fat because I wanted to lose weight. I would eat a whole bowl of rice for lunch on many days. A food that probably spiked my blood glucose levels. If you are interested in the Paleo concept, I suggest that you do some research on what causes people to get fat and unhealthy. It is not the 85% ground beef you are eating, but rather the copious amounts of starches and sugars we eat in processed foods. There is a lot of scientific theory to it and rather than pretend to know exactly everything behind it, I am going to refer you to two books that I found extremely helpful: The Paleo Solution by Robb Wolf and Practical Paleo by Diane Sanfilippo, BS, NC. And again, there is always Google! Bottom line is that I have learned fat is not the enemy. I will admit, I am still skeptical about the whole concept, but I am going for routine blood work next month which also screens my cholesterol, triglycerides, etc. so I will be interested in seeing the results of that blood work. I guess one of the biggest questions I get is what do I eat? I eat a LOT of fruits and vegetables and I eat a lot of meats including beef, pork, chicken, turkey, fish, and on occasion, bacon. I now eat nuts and seeds including cashew butter, sunflower butter, etc. I cook and eat only coconut and olive oil as much as possible. Some Paleo enthusiasts say you should watch your fruit intake if you are trying to lose weight but I feel strongly that I need the nutrients of the variety of fruits that I eat and my primary goal right now is to be healthy. If I lose weight, great. If not, oh well. I have had to completely retrain my way of thinking in terms of meals. No more cereal, pancakes, or yogurt for breakfast. Often I have leftovers from dinner the night before. The variety of food I have tried in the past two months has increased by at least fifty percent. I have discovered a love for sweet potatoes and a hatred for avocados. As often as possible, I eat grass fed and wild caught meat and fish in order to avoid hormones and other nasty things that grain fed animals eat. Eating out is even more of a challenge than when I was only restricting my gluten and dairy intake but is getting easier. We don't eat out all that often but when we do, we chose a place that will not think twice about accommodating my needs. I have to say that I actually enjoy eating out more now because I am eating higher quality food as opposed to fried and processed food. Overall, I would say that I am about 75% compliant with eating Paleo in the past month. After the first month, I realized that I had to make this a lifestyle which meant making it doable. Progress not perfection became my motto. Most Paleo proponents state that the goal should be to be eating Paleo 80% of the time. Although my basic diet is meats, vegetables, fruits, nuts, and seeds, I do indulge in a regular meal or food from time to time but I make sure it is something I will absolutely enjoy every bite of. For example, last week I was on a six day course of steroids for non-autoimmune reasons and I decided I had to have a buffalo chicken pizza from a local establishment. And a regular beer to go with it. Typically, when I eat something non-Paleo, I still make sure it is gluten and dairy-free but I needed that one exception on that particular day. I enjoyed it and the next morning, I was right back on track. Some people may say that I am not doing the autoimmune protocol properly. I say that I am living my life. I did a little experiment several weeks ago where I went off my Paleo eating plan. My fiancé and I were going out of town to visit family and I wanted a weekend where I didn't want to have to think about what I was going to eat. I even ate macaroni and cheese! After several days of that, I can honestly say that I was ready to go back to Paleo. My joints hurt more than usual, I felt like I had the flu, and I was craving salads. The bottom line is: Overall, I am eating healthier than I ever have in my entire life. I cannot remember the last time I had a bowl of rice and I don't even miss it anymore. I am feeding my body whole, nutritious foods. And I have lost weight. Not a lot, maybe a pound every two weeks but what has been more noticeable is the change in my body shape. Fat is turning to muscle. I don't feel bloated anymore; unless I eat buffalo chicken pizza! More importantly, let's talk about my autoimmune symptoms. First I have to disclose than I am also taking a new alternative medication called low dose naltrexone (LDN) which I think has also benefited me so it is hard to ascertain if the improvement is due to my diet, allergy shots I have been receiving, the LDN, or most likely, all of the above. I am currently off steroids and my other autoimmune medication, Arava. That fact is simply amazing. I do have some joint pain but this is precipitated by exercise and/or not enough sleep. My dryness symptoms have improved somewhat which was recently noted by my eye doctor. My asthma is under control and the biggest change I have noticed is an improvement in my reflux and esophageal dysmotility symptoms. Fatigue, unfortunately, is still a major issue at times. I have not noticed any improvement in my Raynaud's symptoms. I still struggle day to day much more than the average person without an autoimmune illness but at this point, I am struggling less than last year at this time. Now could all of this be coincidence? Possibly. Maybe I am just in an upswing with my illness. But I am going with the theory that time will tell and meanwhile, I have absolutely nothing to lose. Thanks for sharing this. I've been doing paleo as well only I'm not sure it's doing me much good. I love the paleo lifestyle too. I also like that many people like you and me are using it as a framework and then making adaptions to fit our individual bodies. I hope you have continued success. I agree. Making adaptations is crucial to success with this way of eating. 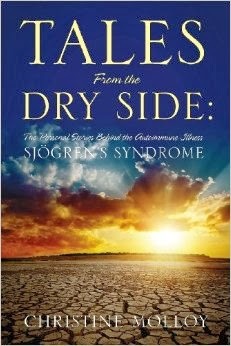 just found you via the sjogrens facebook page! wonderful to have found another blogger also chronicling your life with this illness. I was a 27 year vegetarian when I was diagnosed . Immediately I started to read anecdotal stories about paleo- it was difficult, but as i live on an organic farm I was easily able to source free range eggs and also live close to Georgian Bay ( part of the " cleaner" great Lakes!) to source fresh oily fish. It is hard to know if it is helping but I am sure it isn't harming. Glad to see you have found some relief ! Glad you found your way here. I think there is never nothing to lose by eating healthy! When you say "respirator", what does that mean exactly? I'm sorry that you are having such a tough time with your symptoms. Definitely check in with your doc about the diet. It has helped me a lot.